In honor of our Armed Services I am marching in 2 local parades. The first in my hometown, and although the weather started crappy the crowds came out in full force to cheer us on. Next up we head over to a neighboring town to march for their local fire dept. After all that is done it’s home to finish prepping for Meat-a-Palooza. It has become our tradition to have a picnic and the main course is Smoked Meat. This year we are having pulled pork, brisket, chicken, and a salmon. The hubby has been tending to it since 12am. Whatever you do today, enjoy your day! Sitting in the airport. Waiting on our 2nd leg of the flight home. Been up since 3:30 am Vegas time. 3 hour layover in Chicago. I hate the travel day part of vacation. I will do my best to get the last 2 days of the trip posted as soon as I can. If I can’t sleep on the plane maybe I will type them up and post later tonight. Day 5 and the fun is still commencing. Weds was the Hubby’s Birthday and we had a jam packed day planned. We started the day by sleeping in. Once we got up and dressed an moving, the first agenda item was lunch. Since we knew we would be having a good dinner we opted for a quick lunch. Del Taco was the final destination. I know it’s not some gourmet or even semi-gourmet place but we don’t have Del Taco at home. A Taco and Burrito later and I can scratch that place off the list of places we haven’t tried before. After lunch we headed out to Ms Nail for Mani-Pedi’s, neither of us have ever had them before so it was a good treat. The pedicure was very relaxing and I must say after all the walking from the previous days felt very good. Once the Pedi part was done it was on to the Mani’s. I can say that after the Manicure my fingernails do feel a little smoother. We had separated from our friends for the morning so once we were done with our stuff we called to see where they were and if they wanted us to pick them up. We had taken the rental car and they were out via shuttle and foot. We found them and met them at The Bellagio, Valet’d the car and hopped on inside. 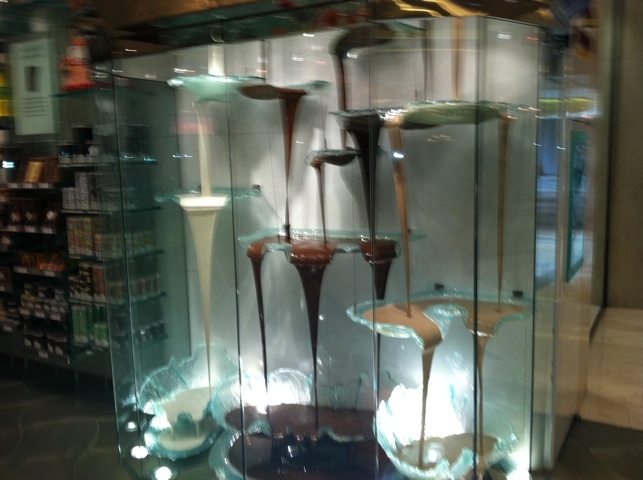 After we found them and they cashed out of the slot machine we made a bee line for Jean Philippe Patisserie and had some Gelato. 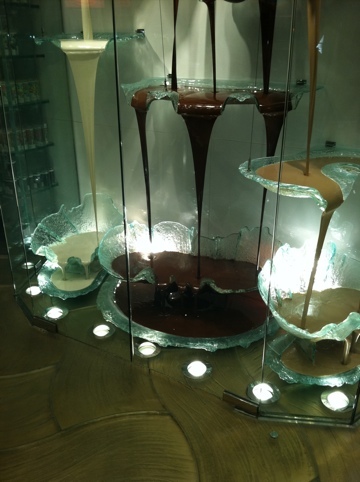 Along with the Gelato we partook in the oohing and ahhing over the chocolate fountain. We made a stop back at the Cirque De Soleil gift shop for some cups we had seen there then headed back to the Condo. Since we still had a couple of hours to kill, we opted for a drink and a dip in the pool and hot tub before heading out to dinner. Here is where the best part of the day/evening begins. This was the only night we had preplanned where to eat for dinner. For the last few years we have gone to The Cheesecake Factory for the hubby’s birthday. 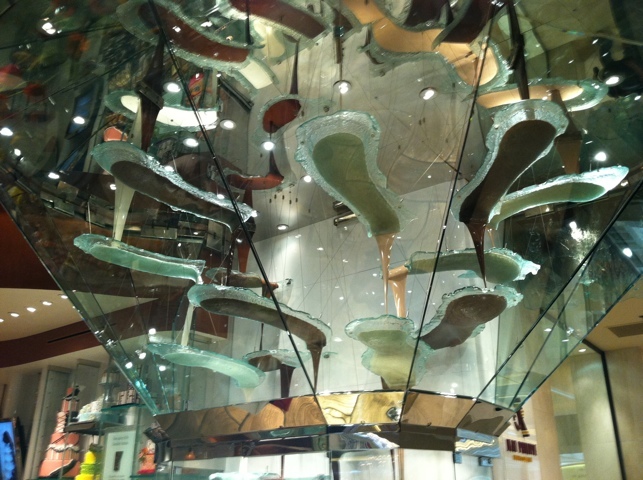 So prior to our trip I researched and found one at The Forum Shops at Caesars Palace. Our friends had never been to one. As much as the place is a “chain” (closest one to us at home is 40 minutes) the food there has never disappointed me. Surprisingly there was no wait (any other time we have been to one there is usually a 45min to 2 hour wait). After much menu scrutiny I decided on the Fire Roasted Artichoke for an appetizer, the Chicken and Shrimp Gumbo for dinner, and the Godiva Chocolate Cheesecake for dessert. All washed down with pomegranate Mojitos. Once dinner was over we had a very long walk (although it was only across the street) to the Venetian Casino where the Blue Man Group Theater is located. The hubby’s request for his birthday for this trip was to see Blue Man Group. None of us had ever seen this show so we were all looking forward to it. The show was fast paced and fun. A bit of education thrown in with some comedy and a dash of audience participation. The show was over and we called it a night. 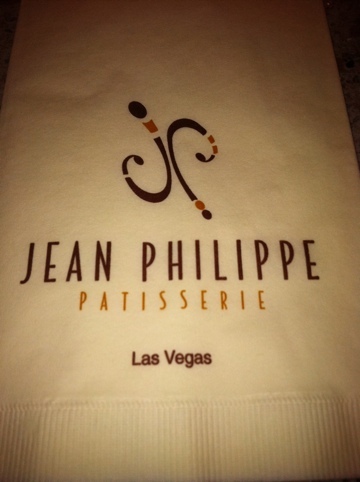 A very late night…..
Another long and busy day here in Sin City. Slept in again since thats what vacations are for. Then we piled in the car and head off on our grand adventure to the Hoover Dam. One quick stop at our friends mom’s house so she could visit then the rest of us headed on out for an afternoon of sightseeing. After a nice lunch at Mel’s Diner, I had the chicken fried steak, hasbrowns, and scrambled eggs, we continued on to the Dam. We opted for the tour of the dam after we just wandered around. It was fun to be in both Nevada and Arizona in a mere matter of seconds. After the leisurely walk across the Dam we headed inside for the tour. It was actually very interesting learning about how they made the dam. After a visit to the Dam gift shop we headed on back to pick up our other friend, grabbed an Ice Cream at Dairy Queen and then off to Vons. Since we are staying at a condo with a kitchen we decided to cook in this evening. The hubby and I went for a quick swim and soak in the jacuzzi before we made dinner. We had a lovely dinner of Shrimp, Salad, sauteed mushrooms, potato salad and coleslaw. Now it’s a leisurely night in the condo drinking and relaxing. So Sunday was a slower paced day. We slept in a bit, picked up a rental car, had a pretty good lunch at In-N-Out Burger (I had mine Animal Style), then stopped for some groceries and Booze. After all the errands were done we had some quality time at the pool with our new found drinks. Dinner was at Tony Roma’s down in Old Las Vegas, we wandered Fremont St and played some Slots. I put in $20 and left the casino with $19.82. The day started early (4am) with our trip from the Hotel to the airport for a 6am flight. We flew from NY to Philly, then onward to Vegas. Our flighe left NY at 6am and we were in the ground by 10am Vegas time. So we pretty much gained a whole day. Once we arrived we luckily able to check in to the Condo way earlier than normal. We had a few hours to kill before our Bowling Wives arrived to join us for our fabulous vacation. We dropped off our luggage and hopped the shuttle to NY NY and then just started walking. Our first course of action was to find some food. The hubby found some reviews for a Noodle shop that served Dim Sum so we stopped there. Noodles at the Bellagio was Fabulous! We ordered Steamed Pork Buns, Shrimp wontons, Peppered Short Ribs, and then a bowl of Barbecue Pork Noodles. The hubby had a beer and I had this fabulous drink called a funky monkey. After lunch we wandered through the casino taking in the sights. When we left to move on to the next stop we timed it just right to see the Fountains of Bellagio show. It was pretty amazing during the day but I want to go back and check it out at night. After the water show we just walked and walked and walked, and people watched. So far the tally is 2 bachelorettes and 1 Elvis sighting. We finally stopped walking when we hit Caesar’s Palace. I played my first $10 in the Penny Slot machine, we decided we were tired and headed back to NY NY to get the shuttle to our condo. Nap time commenced, then it was time to hunt down some dinner. Naturally we had to eat at a buffet. Since the Condo offers a Shuttle to either The Orleans or NY NY we looked to see what the Orleans had to offer for a buffet. It was actually pretty good. So after satisfying our dinner craving we headed back to the condo to await our friends. They finally arrived and after some catching up and chit a chat we retired to bed as we had been up for like 20 hours. Sunday is here and I am enjoying a cup of coffee and some relaxation before we begin the days journey.